While not making the list of my favorite cities, Chinese cities do certainly have their attractions. 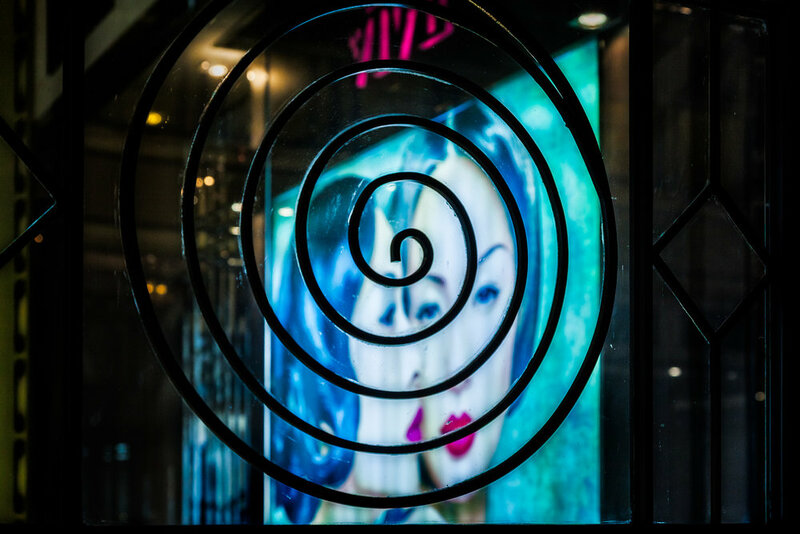 I’ve been to Shanghai on two occasions and, long being a city open to the world, it has plenty of glitz and glamour for the enthusiastic photographer to explore. My first trip to Shanghai was as a guest speaker and trainer for Kodak Professional back in 1995. That particular trip also included presentations in Beijing and Chengdu, cities I’ve visited several times over the years. The above photo was an interesting one to make. I wanted to make a compositionally interesting image that explored the exotic and changing nature of China. I think the sickly colors of the artificial lighting was perfectly inline with my intentions. But while China is known for its often turbulent history and, more recently, for its meteoric economic rise, spirituality, literature and health are also important elements in the nation’s culture. The circular shape in the foreground does suggest infinity. It also reminded me of the power of opposites so eloquently depicted in the Yin Yang symbol. To be able to explore what I see as the often facile nature of fashion and celebrity I wanted an alternative to balance it with. A common theme throughout my work is duality (i.e., opposites), which is probably why I find the Yin Yang symbol so compelling. By focusing carefully on the foreground structure and using a shallow depth of field I was able to separate it from the picture in the background. This visual relief helps provide the impression that the girls, and their lifestyle, are beyond the reach of many of us. That is, of course, unless you purchase the same make up or perfume they’re wearing. I mentioned that composition was an important element in the photo at the very top of this post. Can you see how careful positioning of the camera has allowed me to include the eyes of the models? I’ve used the structure to create frames within frames, an important element in composition. Likewise, I’ve used the structure to introduce an element of tension into the image as it frames the mouth of one of the models and bisects the mouth of the other. Notice also how the pink, red and purple color of their lips and the above signage are visually connected with each other and how those colors contrast with the cool green/blue colored light illuminating the picture of the models. Talk about sweet and sour! The futuristic skyline of Pudong in Shanghai illuminated at sunset. My first trip to Chengdu was in 1988 where I met Shu Lan, one of my very best friends. My fondest memory of Shanghai, from a later trip, was an evening spent in the charming Jazz Club at the famous Fairmont Peace Hotel. The Peace Hotel is situated just off the famous Bund where you can promenade past stately European commercial buildings that harken back to the days when Western powers held significant concessions in China. 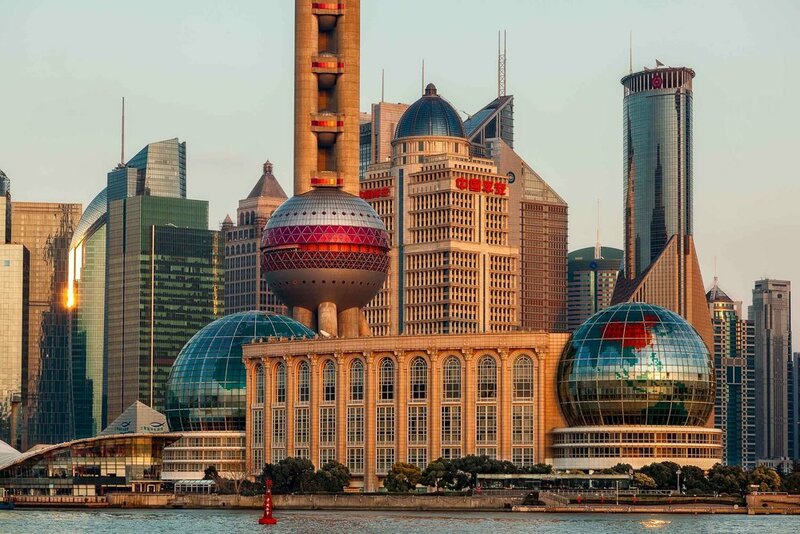 Alternatively you can turn your gaze across the Huangpu River towards Pudong and its futuristic views of modern China. 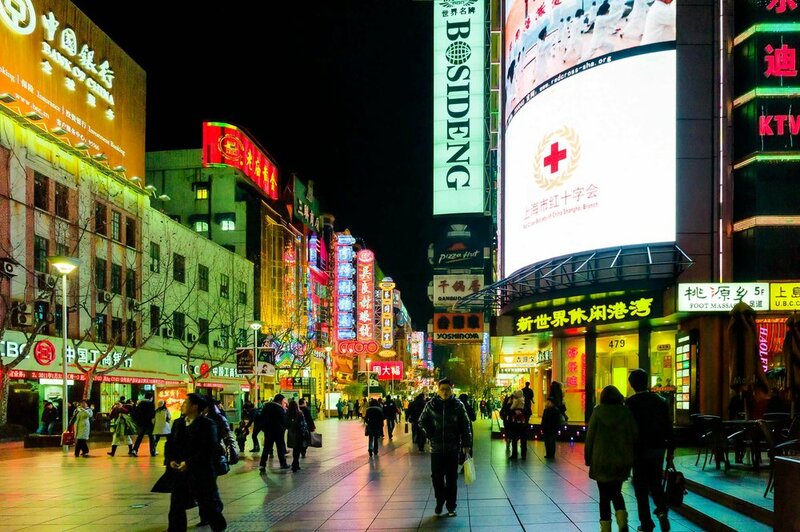 Pedestrians at night making their way along the glitzy Nanjing Road in Shanghai, China. Sunset photography from the Bund is an opportunity well worth scheduling should you ever journey to this mega city. Views across the Huangpu River to the Pudong commercial zone are fabulous at this time of day. When the sun has set prepare yourself for a walk up Nanjing Road where glitzy neon lights offer great opportunities for night photography. I travelled back to Shanghai on route to experiencing the sublime beauty of Huangshan (i.e., Yellow Mountain) where I spent three days, in the middle of winter, hiking and photographing. Now that was an adventure. One which I plan to repeat. 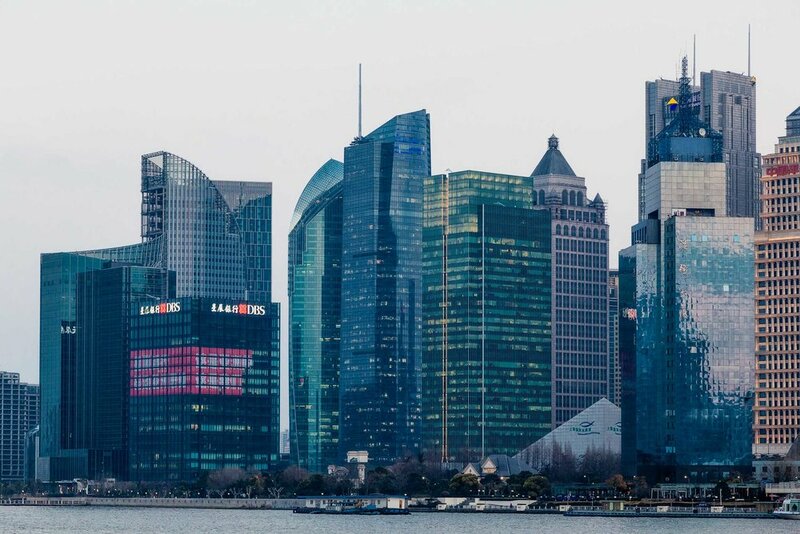 The dynamic skyline of the Pudong district in Shanghai illuminated by the gentle light of dusk. During my most recent trip to China I returned to the Peace Hotel for an evening of nostalgia. The resident jazz band has played there, in one form or another, since 1929 when the hotel first opened under the name the Cathay Hotel. Most of the band members have been together for decades and their average age is, I believe, 82. I see the Jazz Bar at the Peace Hotel as a metaphor representing a safe haven in a time of turmoil. Of course one of the great things about travel is that it provides so many of us with the assurance that life, in our own neck of the woods, really isn’t all that bad. Actually that day’s adventure started a little earlier. After arriving in Shanghai and checking into my accommodation I headed off for a sunset photography session along the Bund followed by a lovely meal in a Western Resturant at the Peace Hotel. I even scored a table with a wonderful view across the Huangpu River. After dinner I made a few photos in the lobby prior to heading out to photograph the neon-lit Nanjing Road. As a reward for my endeavors I headed back to the Peace Hotel for another lovely evening in the Jazz Bar. It was winter and it was cold, but what a perfect evening!